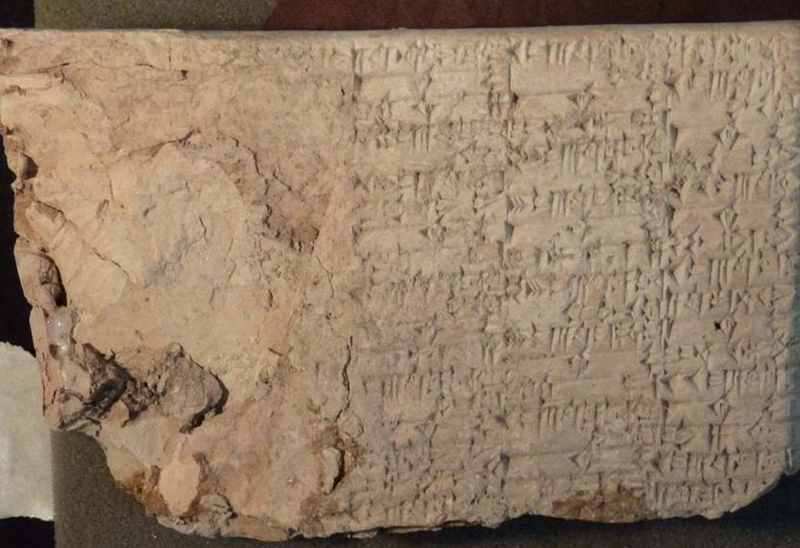 This week’s announcement that Hobby Lobby reached an agreement with the U.S. government over hundreds of smuggled cuneiform tablets and other artifacts brought a lot of questions. People were under the impression that the historical loot was being sold at stores. But, this report by NPR indicates Hobby Lobby’s owners are in the process of building a Bible museum. Below is the forfeiture complaint, which has a lot of details but sheds no light on why the items were acquired. FRESNO, Calif. — One person has been sentenced to prison in connection with a pot farm found in a prehistoric site in the Domeland Wilderness in the Sequoia National Forest. Carlos Piedra-Murillo, 30, of Mexico, was sentenced to two years and one month in prison for conspiring to manufacture, distribute and possess with intent to distribute marijuana. Authorities located more than 8,000 marijuana plants, a .22-caliber rifle, a pellet rifle and .22‑caliber ammunition in August 2016. The marijuana cultivation operation caused extensive environmental damage. It covered about 10 acres and was within the burned area of the 2000 Manter Fire. Some of the new vegetation and trees that sprouted after the fire had been cut and trimmed to make room for the marijuana plants. Water was diverted from a tributary stream of Trout Creek, a major tributary to the Kern River. Fertilizer and pesticides, including illegal carbofuran and zinc phosphide, highly toxic pesticides from Mexico, were found at the site. Large piles of trash were found near the campsite. The moving of soil to accommodate a basin around each marijuana plant caused extensive damage to a large prehistoric Tűbatulabal archaeological site. Holes were dug in the middle of the archaeological site and artifacts were found scattered on the surface among the marijuana plants. Also charged were Juan Carlos Lopez, 32, of Lake Elsinore; Rafael Torres-Armenta, 30, and Javier Garcia-Castaneda, 38, both of Mexico. Torres, Lopez, and Garcia have also pleaded guilty and are awaiting sentencing. According to the U.S. Department of Justice, a Pakistani native began smuggling artifacts into the United States after using a sham marriage to gain citizenship. The artifacts included ancient coins, bronze and iron axes, spears, arrowheads, swords and daggers and were sold at shows and online through his company, Indus Valley. When a shipment of some 1,300 artifacts got flagged by customs agents at Washington Dulles International Airport in 2013, he and others claimed the objects were inherited family property valued at $500. ALEXANDRIA, Va. – Several individuals were indicted by a federal grand jury Thursday for citizenship fraud and smuggling cultural artifacts into the United States. This case was investigated by U.S. Immigration and Customs Enforcement’s (ICE) Homeland Security Investigations (HSI) and the Department of State’s (DOS) Office of Inspector General. Three individuals – Ijaz Khan, 42, and Vera Lautt, 56, both of Sante Fe, New Mexico, and Ibrar Khan, of Pakistan – face charges for conspiracy to defraud the United States and naturalizing and procuring U.S. citizenship by fraud. Ijaz Khan, along with Fahad Khan, of Pakistan, face additional charges, including smuggling artifacts from Pakistan into the United States and obstructing justice. 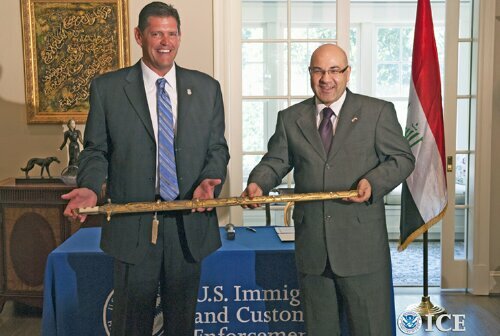 WASHINGTON – A ceremonial sword, looted in 2003 from Saddam Hussein’s personal office in Baghdad, was returned to the Republic of Iraq Monday by U.S. Immigration and Customs Enforcement’s (ICE) Homeland Security Investigations (HSI). The sword, which had been smuggled into the United States by U.S. military personnel, was repatriated at a private ceremony held at Iraqi Ambassador Lukman Faily’s residence in Washington. The sword is a 43-inch embellished blade and sheath with gold inlaid Arabic writing along the edge of the blade that declares it to be a gift to Saddam Hussein. It was sold in October 2011 to the Amoskeag Auction Company in Manchester, N.H., and advertised in their Jan. 7, 2012, auction catalogue as having been removed from Hussein’s personal office in the Iraqi military command complex in Baghdad by the U.S. Army 126th Military History Detachment after the regime fell in 2003. The catalog also said that the consignor was attached to the unit as a combat historian, that the sword was not claimed by the U.S. government and that the consignor was granted permission to keep the sword as a souvenir. In January 2012, HSI special agents in Manchester learned that it was being auctioned and initiated an investigation. Although the sword was sold at auction for $15,000 by AAC Jan. 7, 2012, the sale had not been consummated by an exchange of money and the object had not yet been shipped to the purchaser by AAC. 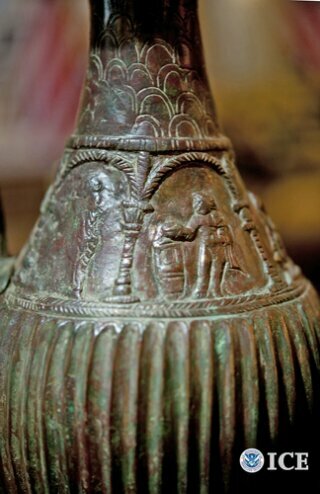 On Jan. 9, 2012, HSI special agents seized the sword as a possible Iraqi cultural artifact. HSI special agents coordinated with the U.S. Department of State and the U.S. Department of Defense regarding the validity of the sword’s importation into the United States and the regulations surrounding the importation of war trophies from Iraq. It was determined that this ornate ceremonial sword cannot be considered a modern battlefield weapon and is therefore not eligible to be exported as a war trophy. Additionally, the import of this historic sword was prohibited by DOD’s Office of Foreign Assets Control pursuant to an executive order which prohibits trade or transfer of Iraqi cultural property. On April 30, 2012, the sword was administratively forfeited. In 2008, 2010 and 2011, ICE repatriated to the government of Iraq a collection of cultural objects including Saddam Hussein-era paintings, AK-47 rifles, ancient tablets, clay statues, ancient gold earrings, coins, a Western Asiatic necklace and terra cotta cones, all illegally imported into the United States from Iraq. Through HSI’s cultural property and antiquities investigations, a team of HSI special agents recovered Iraqi treasures, and investigated the looting of the Iraq National Museum following the fall of the Hussein regime. The team volunteered to lead this mission, and scoured Baghdad in search of more than 17,000 items that chronicled the region’s 7,000 years of civilization. HSI special agents electronically scanned the museum’s inventory lists and manifests to determine which items were missing, and quickly determined that most of the museum’s artifacts had been hidden. Eventually, they were able to recover many of the items that were looted by cultivating sources. Agents were also able to send information about looted artifacts to other countries to help recover them if they crossed their borders. SALT LAKE CITY —Usually it’s buyer beware. If you’re going to buy something expensive — a Rolex watch or piece of art, for instance — you want to make sure it’s real and not a cheap imitation. And, like the Pawn Stars crew, sometimes you have to call in the Guy with the Hat to have it checked out. 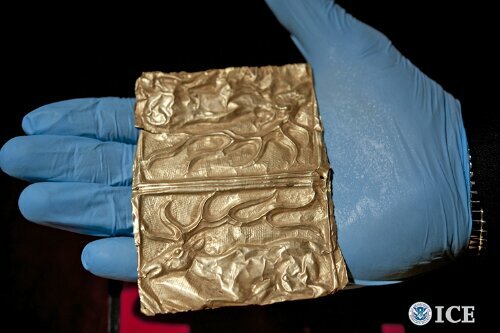 Now customs agents said they busted a smuggling ring that was trying to disguise artifacts looted from Peru as cheap knockoffs in an attempt to sneak them into the United States, where they were sold for tens of thousands of dollars. On Wednesday, a federal grand jury in Utah handed up indictments charging Cesar Guarderas, 70, and Rosa Isabel Guarderas, 45, naturalized U.S. citizens from West Valley City, and Peruvian nationals Javier Abanto-Sarmiento, 39, and Alfredo Abanto-Sarmiento, 36, with smuggling Peruvian artifacts and interstate transportation of stolen property. The charges came following an undercover probe by U.S. Immigration and Customs Enforcement’s Homeland Security Investigations. 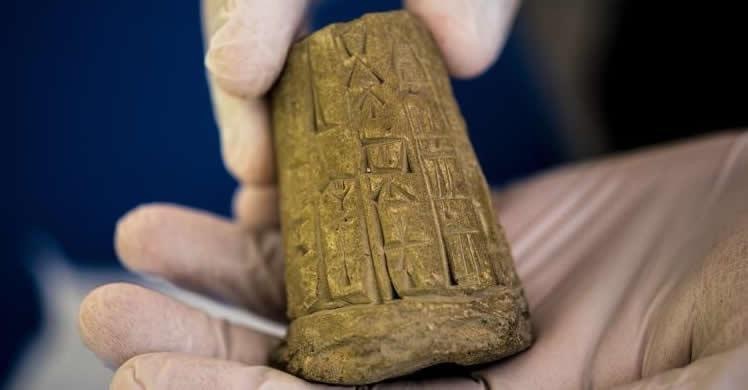 Customs officials allege the group imported authentic cultural artifacts by using a contact at the National Institute of Culture of Peru who provided forged government documents certifying the items were replicas. The investigation began in October 2012, and the following month undercover agents arranged to buy artifacts from Guarderas. They put down $3,000 towards two items and later picked up 10 more for $20,000, according to customs officials. Guarderas told the buyers that the artifacts were real. Enter the Guy in the Hat, in this case experts from Utah Valley and Tulane universities and testing at a University of Washington, Seattle laboratory, which determined the artifacts were genuine. So the stuff that was made to look fake was real. Over the course of the investigation, HSI special agents captured the defendants discussing the trafficking conspiracy including Cesar Guarderas saying Javier Abanto-Sarmiento had access to more than 100 pieces of pottery in Peru and was willing to ship them to the United States. They were also recorded discussing how the ring bribes officials in Peru to get the artifacts out of the country; and stating that they know where to look for buried pottery. Cesar and Rosa Isabel Guarderas were arrested March 25 and later released pending trial.Javier Abanto-Sarmiento was arrested in Miami March 4 when he arrived in the United States from Peru. Alfredo Abanto-Sarmiento, who is in Peru, remains at large. DETROIT —The owner of an Oxford, Mich., auction house was arrested Tuesday (Feb. 12, 2013) by special agents with U.S. Immigration and Customs Enforcement’s Homeland Security Investigations for allegedly making false statements and on charges of transporting and selling a Korean artifact. James Amato, 50, of Oxford, Mich., was arrested without incident at his residence after being charged in a federal arrest warrant with making false statements, transportation of stolen goods and for the sale or receipt of stolen goods, ICE officials said. Amato is the second suspect to be arrested following a two-year investigation into the sale of a Hojo currency plate from 1893. Won Young Youn was arrested Jan. 9 in Fort Lee, N.J., on similar charges, according to ICE officials. Youn remains free on bond and has a preliminary hearing April 17. According to the investigation, Amato, the listed owner of Midwest Auction Galleries, allegedly sold the currency plate in 2010 to Youn for $35,000. Amato sold the plate on behalf of the family of a deceased American serviceman, who reportedly brought it back to Michigan after a tour of duty in the Korean War. While the item was listed for sale and before Youn’s purchase, Amato and Youn were contacted by officials with the Korean Embassy and the U.S. State Department, and advised that the sale of the item could be in violation of the National Stolen Property Act. 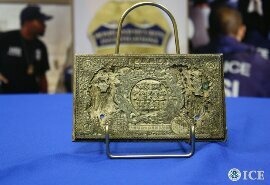 After the sale, HSI launched an investigation into the item, which experts believe is one of three currency plates still in existence from the 1890s. The currency plates ushered in modern currency printing methods in Korea. EL PASO, Texas —U.S. Immigration and Customs Enforcement returned more than 4,000 pieces of stolen and looted cultural artifacts to the government of Mexico at a repatriation ceremony Oct. 15 at the Consulate of Mexico in El Paso, Texas. The items were recovered in 11 separate investigations by special agents of ICE’s Homeland Security Investigations in Douglas, Ariz.; San Diego, Calif.; Chicago; Kalispell, Mont. ; Alpine, Del Rio and Laredo, Texas; and one in Mexico City, in coordination with Mexican law enforcement agencies. Among the archeological pieces returned to the people of Mexico are the following: five pre-Columbian statues, more than 4,000 pre-Columbian artifacts and 26 pieces of pre-Columbian pottery that date back more than 1,500 years. The return of this cultural property is the culmination of HSI undercover and sting operations with assistance from U.S. Customs and Border Protection, who interdicted many of these items at various ports of entry. About 4,000 other archeological objects of assorted pre-Columbian artifacts. Of the objects returned Oct. 25, three pre-Columbian statues were discovered during a CBP agricultural inspection of an individual who arrived on a bus at the Lincoln-Juarez Bridge Port of Entry. Another pre-Columbian undeclared clay statue was discovered hidden in the luggage area of a person’s vehicle entering the Del Rio (Texas) Port of Entry from Mexico. A fifth pre-Columbian statuette was also discovered along with an Aztec Eagle whistle concealed in the dashboard of another person’s vehicle entering the Del Rio Port of Entry. An undeclared pre-Columbian metate – grinding stone – was discovered in the vehicle of two individuals entering the United States from Mexico at Naco, Ariz. Also discovered at the Naco Port of Entry, was another metate with four manos – a stone used as the upper millstone for grinding foods –lying in the bed of a person’s truck, who said he stayed at his grandfather’s ranch during his visit to Mexico and was bringing back clothes and tools. Two copper hatchet artifacts were discovered in cargo received at San Diego International Airport via Sweden. While screening express mail at the Chicago Port of Entry, a CBP officer intercepted a parcel for inspection containing a falsely declared clay anthropomorphic statue dating to the early first millennium A.D. CBP officers, assigned to the Chicago Port of Entry, also discovered a shipment containing a Chinesco Nayarit figurine exported from the United States. In a June 2009 undercover operation, HSI special agents in Alpine recovered from an individual in Fort Stockton, Texas, 200 Mexican artifacts alleged to have been smuggled into the United States after being stolen in July 2008 from a private collection and museum in Cuatro Cienegas, Coahuila, Mexico. Later in November 2009, Texas Department of Public Safety troopers assisting HSI special agents stopped the same individual in a vehicle for a traffic violation and observed artifacts in the vehicle that the driver admitted were undeclared when he entered the United States at the Presidio (Texas) Port of Entry. After HSI special agents seized the artifacts, they opened a second investigation associated with the seizure of more than 4,000 artifacts including arrowheads, bows, rabbit sticks, axes, spears, tomahawks, statuettes, sandals and beads, all relating to the same conspiracy. HSI special agents seized 26 pieces of pottery greater than 1,500 years-old following an investigation in Kalispell, Mont., regarding a consignor who had paid members of the Tarahumara tribe to loot artifacts from burial caves in the Copper Canyon area of Chihuahua, Mexico, so he could consign them in a local art gallery. HSI’s investigation determined that the objects were removed from Mexico in violation of Mexican law and brought into the United States in violation of U.S. laws and regulations. A U.S.-Mexico treaty of cooperation regarding the recovery and return of stolen archaeological, historical and cultural properties, which was negotiated by the U.S. Department of State and enacted in 1970, restricts the importation of pre-Columbian artifacts and colonial-era religious objects into the United States without proper export documents. Note to self: If I ever decide to raid protected battlefields for historic artifacts, don’t include the plans in a “note to self.” At least not a written one. Last year, federal park rangers busted a Virginia man for combing Civil War-era Petersburg National Battlefield (listed on the National Register of Historic Places) with a metal detector and digging up musket balls, belt buckles shrapnel and other hardware discarded during clashes more than 100 years ago. Authorities had suspected him for some time, catching glimpses of a license plate on a suspicious truck or noticing a man standing around trying to look nonchalant or bolting and leaving behind pruning shears used for digging. They even had motion detector cameras that got pictures of him. The guy — his name is John Santo, according to court records — kept a journal, noting dates, locations and items he unearthed. So when investigators finally caught up with him and searched his home and garage (an affair that the Progress-Index newspaper said required the bomb squad because of a potentially explosive shell), they had an inventory of his exploits. The rangers could compare their own “suspicious hole” reports with Santo’s diary. For instance, his March 27, 2009, entry includes “run in with park ranger” along with a note that he found part of a brass fuse. The following day’s entry states “bought $6 pruner (shears) … I hunted the same area,” according to a Statement of Facts document filed in federal court in November. He also found a Confederate ball projectile that day. In all, the government totaled the damages for disturbed ground and stolen artifacts at $37,900. They found more than 9,000 items, which are now the subject for forfeiture proceedings. In December 2011, Santo entered guilty pleas to damaging archaeological resources and depredation of government property, and sentencing will be at a later date. By the way, his last treasure hunting entry was Dec. 21, 2010, when authorities caught him standing around 12 fresh holes with a metal detector, shears and bullets. 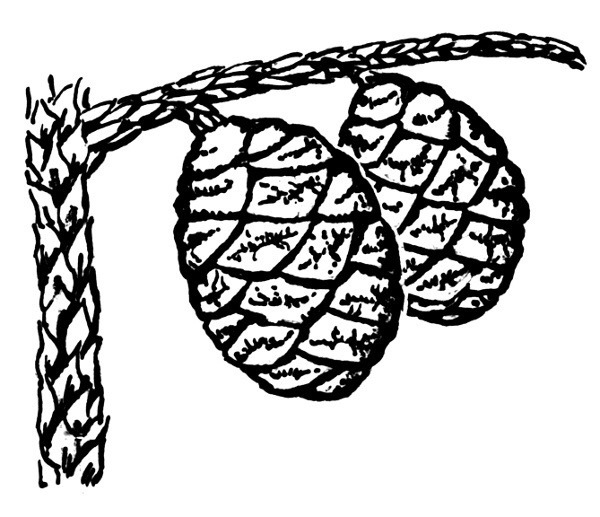 The journal noted “caught by Park Rangers,” according to court records.